Developed in close collaboration with some of the UK’s most well-known companies, this pioneering degree programme offers a distinctive balance of IT, Management, and Business to ensure that you have the skills and expertise needed to thrive in the industries of the future. At every level, UCL’s Information Management for Business (IMB) undergraduate degree programme is underpinned by emerging research and practice. The School of Management focuses on the impact of innovation, new technologies, analytics, and entrepreneurship on business transformation. It delivers world-class research through four research groups: Organisations & Innovation, Strategy & Entrepreneurship, Operations & Technology, and Marketing & Analytics. These provide the cutting-edge context within which the IMB programme has been developed and continues to evolve. This programme, which is a business and management degree programme, benefits from the close collaboration and know-how provided by our colleagues in the Department of Information Studies (DIS), an international centre for knowledge creation and transfer, whose research aims to develop the understanding and insights needed to shape the emerging information environment. Hence, alongside the development of analytical tools and modelling skills appropriate to the business applications of IT the IMB degree is designed to develop you as an independent thinker and as a confident and creative problem solver who is ready and able to contribute to the next wave of business transformation. Current students: if you wish to see your programme, please login to Moodle to access. The purpose of the first year is to provide you with the best possible grounding in information technology, leadership and management. This serves as a foundation for the development of professional skills, knowledge, understanding and expertise throughout the rest of the programme. You will take eight compulsory modules in the first year covering both IT and management subjects. The second year further develops core knowledge whilst allowing specialisation through the choice of an elective module from a set of options that reflect typical graduate destinations. In this way, you are able to develop the skills and knowledge most appropriate to your career aspirations. You will take seven compulsory modules in the second year covering IT, finance and management subjects and you will also select one elective module from a list of guided options. The final year consists of four compulsory taught modules, the extended project, and the opportunity to select a further two elective modules enabling you to further develop your skills and proficiency in areas most appropriate to your own learning and career ambitions. Before the start of the final year you will be expected to identify a specific area for an extended project, which is often undertaken in close collaboration with one or more employers in our network. Project options range from more academically-oriented dissertations, through consultancy style, problem-oriented, projects to the exploration of new business opportunities in an enterprise project. We do not offer a part-time study programme on the BSc Information Management for Business course. Throughout the programme you will be able to take advantage of extra-curricular activities and scenario weeks which reinforce your knowledge and afford the opportunity for you to work with academic and industry leaders. As a student of the Faculty of Engineering you will also take part in the “How to Change the World ” programme, where students from all engineering departments collaborate on challenge-based, problem-solving activities. Working with partners from organisations such as the Red Cross/Red Crescent, Department of Transport, Department of Energy and Climate Change, and the World Bank, students gain the chance to examine real-world challenges in creative, interdisciplinary teams. We actively encourage students to engage with UCL’s large and diverse range of societies. It shows commitment, teamwork, and self-development. If you want to go one step further, you can join your club or society’s committee and get some management experience too. The School of Management has its own student society whose core work consists of serving the best interest of the students of the school through a mixture of social and academic events including networking sessions and employer panel events. All students of the School of Management automatically become members of the School of Management society. UCL was founded in 1826 as a radically different university, opening up higher education for the first time to people of all beliefs and social backgrounds. It was also the first English university to admit women students on equal terms with men. We typically we have between 100-120 students join the IMB programme each year with approximately 45 nationalities represented. Our ambition is to achieve an equal gender split of 50:50 females to males. The programme will provide you with many skills, including: a solid core in business, project management and team-working; greater depth and breadth in technical capacities; and a foundation in excellent leadership. You will develop the professional, personal and inter-personal skills to enable effective communication at all levels within an organisation. IMB graduates work with leading companies in the UK and internationally, in sectors as diverse as investment banking, computer programming & consultancy, advertising, insurance and management consultancy. From the first week of your studies our close contacts with employers will provide you with opportunities to work with leading companies. The leadership, professional, technical and personal skills developed during your degree programme will provide you with a very broad range of employment and study options upon graduation. The IMB Team provides bespoke and exclusive careers support throughout your time at UCL, and as you climb the ladder throughout your career. Our Careers Consultants give you the skills to impress potential employers by providing careers coaching and guidance via 1:1s and group workshops, while our Employer Engagement Team facilitate connections with employers both in the UK and globally via bespoke employer event programmes. This is an essential complement to our academic programmes, enabling us to best prepare you for your future careers, and support you to identify and achieve your goals. The UCL Information Management for Business undergraduate degree programme aims to develop you academically, professionally and personally, and to cultivate interpersonal skills and acumen to enable you to become creative managers and influential leaders. In this innovative programme, the development of effective business, project management, and personal skills are as important as technical skills. If you are passionate about the how technology drives business and want to push yourself in your quest to forge a career in the industries of the future, or want to develop your knowledge of IT, management and leadership then this programme will be instrumental in achieving your goals. If you want to know why you should consider the BSc Information Management for Business (IMB) programme, read what some of our past students have had to say…. The IMB programme is about connecting business with technology in the new digital economy and we are looking for students who are innovative, resourceful, and adaptable. Where you have undertaken specific activities with tangible outcomes, not simply your aspirations. You will need to apply for this programme through the UK Universities and Colleges Admissions Service (UCAS) system. The earlier you apply the better, as the programme is very heavily over-subscribed. GCSE requirements, including Modern Foreign Language, are for Home/EU applicants who have been solely educated in the UK (ie they do not apply to International applicants completing their A Levels in the UK). The pass in a 4th A Level subject to at least AS Level applies only to UK educated applicants, not to international applicants educated abroad. You will need AAA grades at Advanced (A) level. We do not specify the subjects you need to study as we take the view that this programme needs to be open to everyone who has a burning desire to change the world for the better, and who wants to make a high flying career in technology, business, management, leadership and enterprise. If English is not your first language, from 2016 the English language requirement is for the ‘Good’ level. For acceptable English Language tests see here. For all admissions related enquiries, please email undergraduate-admissions@ucl.ac.uk. Remember to always include your UCAS ID number in your email. Apply through UCAS - https://www.ucas.com from 1st September onwards for entry in September the following year. UCL provides regular open days and other forms of public access http://www.ucl.ac.uk/prospective-students/access-ucl/open-days. Anyone wishing to visit to discuss the BScInformation Management for Business (IMB) programme and the opportunities that it provides is always very welcome to do so. Additionally, we provide open days for particular schools and other student groups by prior arrangement. Scholarships are available through UCL for all years of study. Competition for scholarships is fierce, however, and to stand a chance of being chosen you will need to show evidence of commitment and the potential for high achievement. Application for scholarships and bursaries must be made either when confirming your place before the start of your studies, or else at the start of each year of study. For further information regarding the IMB programme, please contact Jemma Leahy, Undergraduate Administrator, UCL School of Management. Our students have the world at their feet. The Information Management for Business programme combines the highest quality of education, a pioneering and ground-breaking approach to the relationship between technology, business and management, and links to industry and commerce. As a result, IMB graduates go on to work in banking, consultancy, financial services and industry, as well as having the pick of postgraduate choices, including places at UCL and all of the top universities in the world. As an Information Management for Business student, you will benefit from a bespoke Careers and Employer Engagement programme and a dedicated careers team who will help you present yourself to leading graduate employers with confidence. Please click here to go to our careers support page. 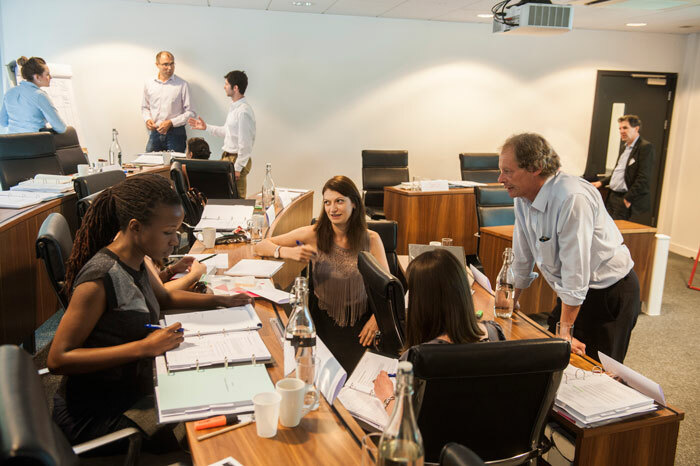 Contacts with the companies and organisations which support the Information Management for Business (IMB) programme start early in the first year of the course. You will be introduced to people from the largest and most successful organisations in every industrial, commercial, consulting and financial sector right from the start of your studies. This means that you can begin to form your own impressions of the types of organisations that you would like to work for and the careers on offer – and, in particular, the careers that inspire you. The companies offer a variety of work opportunities to suit all student requirements. These range from short periods of work shadowing and observing, through to the opportunity to take a full year out on an industrial or commercial placement. There are also plenty of options for placements of between one and four months, which are taken during the summer vacation. Students wishing to take a full year out need to arrange this with the programme director and the company offering the placement. A full year out is normally taken between the second and third year. The list of opportunities for work experience, internships and industrial and organisation placements is growing all of the time. From 2012, we have had a formal link with Cisco Systems, and this includes the opportunity for IMB students to work for the company for a year, either in the UK or in California. The first student to go out there was Amna Asghar. I’m interested in taking a degree in business studies or business management. Is this course for me? This is not a generic business studies or business management degree programme. However, if you are interested in exploring how technology impacts on business then IMB is the programme for you. I’m interested in taking a degree in computer science. Is this course for me? Whilst coding does play a part in the curriculum, this is not a computer science degree programme. However, if you are interested in how technology impacts on business then IMB is the programme for you. No. Whilst coding does play a part in the curriculum we assume no prior knowledge of programming or previous computer science studies. To apply for this programme, you need to do submit an applications via UCAS - https://www.ucas.com - from 1 September onwards for entry in September the following year. You can apply to this programme from 1 September each year, for entry the following year September. How much does it cost to study on this programme? Please read UCL’s guidance on fees. Yes, we run open days at the same time as the rest of UCL. For the latest information on dates and tickets, please take a look at the UCL Open Day site.